Join El Cigar Shop in celebrating some of our country’s greatest (and not so great) leaders by lighting up the cigars associated with the president. Since 1879 Americans have been celebrating President’s Day. Join El Cigar Shop in celebrating some of our country’s greatest (and not so great) leaders by lighting up a Padrón 1964 Presidente. While George Washington, like many Virginians, grew tobacco, Founding Father and 4th President James Madison was the first to smoke cigars in the oval office. The seventh president, Andrew Jackson, was such a regular user of cigars that brass spittoons were installed all around the White House. After a Union victory, General Ulysses S. Grant celebrated with a victory cigar. Then later, as the eighteenth President, he would leave the White House at the end of the work day and take a short walk to the Willard Hotel, relaxing in the lobby smoking one or two cigars. Since it was difficult for people who had business with the government to get a meeting with the president at the Oval Office, they would wait in the hotel in hopes of getting a few words with Grant. It was said Grant smoked up to 20 cigars a day. Chester Arthur, the twenty-first U.S. president, from 1881 to 1885, was known to host lavish midnight suppers and concluded his meals with Champagne and expensive imported cigars. After breakfast meetings with members of Congress, President Calvin Coolidge would hand out cigars and light up. It was reported that Coolidge often used cigars as a weapon to influence people and conversations. Throughout Dwight D. Eisenhower’s administration in the 1950s, state and private dinners at the White House often concluded with the men retiring to the Green Room, a state parlor, for after dinner drinks and cigars, led by the president. 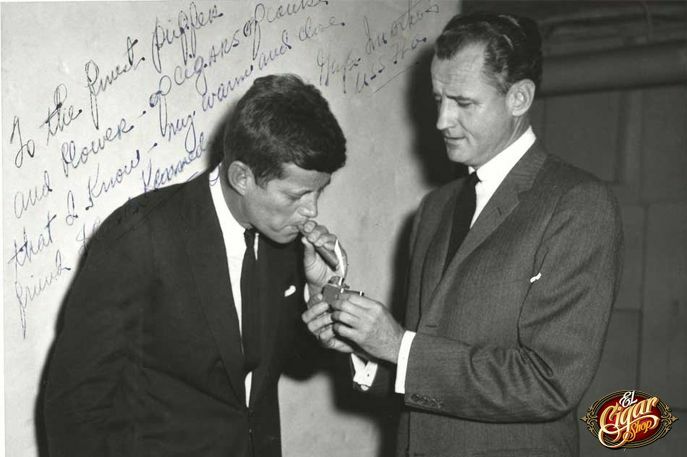 John F. Kennedy favored the Cuban H. Upmann Petit Corona. Once in the White House, President Kennedy saw the Cuban crisis land on his desk. On February 6, 1962, he directed his press secretary, Pierre Salinger to acquire as many Cuban cigars as possible. Salinger returned with an estimated 1,200 cigars. It was then that Kennedy signed the Cuban embargo. I have no doubt JFK would appreciate today's modern H. Upmann cigars. Richard Nixon was the last President to offer guests cigars in the Green Room. The official cigar of the Nixon Administration was Joya de Nicaragua; however, the branding was short-lived after the Sandinistas overthrew the government and confiscated the factory. The powerful Antaño 1970 is said to emulate the cigar Nixon would have handed out. Then there is Bill Clinton. That infamous cigar is rumored to be a Gurkha Grand Reserve. If you’re looking to sample a Gurkha, I recommend the budget-friendly Gurkha Seduction. (No pun intended). Gurkha Cigar has crafted a special cigar to commemorate Donald Trump’s presidency, the “Trump Presidente”. The cigars are not intended for public sale. Instead, they are offered as diplomatic and celebratory gifts. Trump, however, does not smoke. Like the Trump Presidente, the Gurkha Cellar Reserve Platinum 12 Year is crafted with an Ecuadorian wrapper paired with Nicaraguan binder and fillers creating a complex, full flavored smoke. Alec Bradley Post Embargo Toro is a blend of two binders, prime long-fillers from Nicaragua and Honduras rolled in a Honduran wrapper. This medium to full-bodied cigar has flavors of earth, spice, cocoa, and nuts, with a slightly sweet finish. Post Embargo has a label proudly featuring the flags of both the United States and Cuba. Flathead V660 by CAO is inspired by 1950’s hot rods and pin-up girls. A Connecticut Broadleaf wrapper blankets a Habano Connecticut binder and Nicaraguan Ligero and Piloto Cubano Ligero fillers. The blend creates a flavorful cigar with notes of earth, leather, chocolate, and black pepper. Kentucky Fire Cured Cigars by Drew Estate includes American fire-cured tobacco leaves from Kentucky and Virginia. While normally tobacco is air-cured, these leaves are left to hang in specially-constructed curing barns; a process that dates back more than 200 years. The end result is hickory smoked perfection. If you like fine Kentucky bourbon and cigars, you must try El Cigar's Family Series Sawyer- Blanton's Bourbon Infused Toro. The Nicaraguan puro is encased in a Habano wrapper infused with small batch, single barrel Blanton's Bourbon. The cigars are made in America at the famed El Titan de Bronze factory in Little Havana. Try these and more inspired cigars or visit El Cigar Shop to buy cigars online or at our retail store.